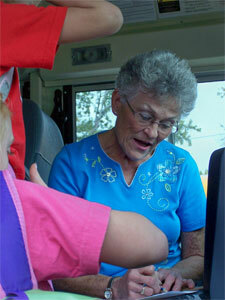 Above, veteran school bus driver Judy Guenette of Chebanse checks the manifest as her student passengers board her bus. School bus drivers in Iroquois and Kankakee counties receive mandatory training through the I-KAN Regional Office of Education. Though hired by various transit companies, the Regional Office is responsible for conducting and keeping records of the initial training that is required for all new school bus drivers and the annual refresher workshop that is required in the 12 month period prior to renewing their school bus permit. Each year, experienced drivers are required to take a two hour refresher course and all new drivers must take an eight hour course in school bus driver safety and first aid as prescribed by the Illinois State Board of Education. Last year, the I-KAN ROE trained 216 new bus drivers and provided refresher training for 480 drivers. For more information, Email or Call (815) 937-2950.